Competition was tough at this years Lux Awards with LED light sources, Fixtures, and Controls as you would expect dominating the entries. As a judge on this years panel I was really impressed with the manner in which Light Fixture designers have made heat sinks an aesthetic feature of a light fitting rather than an ugly injection moulding that is a necessity to any LED Light Fixture. This was opitimised with the joint entry between Speirs and Major and Cree with their fitting aptly named Aeroblades that quite rightly won the exterior Luminaire of the year award. The format took a Dragons Den style where manufacturers had a 15 minute slot to impress us with the features of their entry, judges then sat around a table to discuss the pro’s and con’s of each entry and come up with a winner for each of the categories. Lighting Designers , Lamp Manufacturers and customers of General Lamps have asked me why I and the other judges selected the Toshiba E Core candle as the winner of the Light Source Innovation of the year category? We have all seen most of the LED candles that are available to us. They all have their good and bad points but the Toshiba E Core range ticked most of the boxes that we where looking for in a replacement light source. A brilliant sharp light that will enhance any chandelier. Are the same size envelope as an incandescent candle. 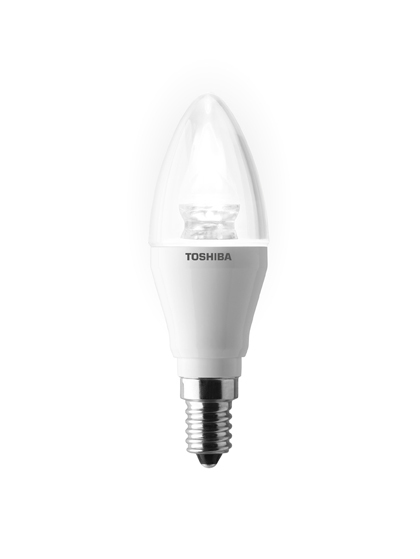 The Toshiba E Core candle’s 6w power gives the equivalent to a 25w incandescent light source. It was these criteria that lead us to give the Toshiba E Core candle the light source innovation of the year award. Samsung and Toshiba as a Light Source Manufacturer ? There is one disappointment that we have with Toshiba, in that they have just discontinued all bayonet cap lamps meaning that they can only offer the E Core candle in E14 small Edison screw cap. This is synonymous with some of the “Big Hitters” that are trying their luck in the Lighting Industry. Samsung have the same issue screw caps only . So why? When the big players analyse the market for replacement lamps they can see that globally screw caps are the most popular so they focus on making products with screw caps only, to make an impact on the biggest markets which on the outset would seem logical. It isn’t as simple as that though if your competition has a full range of lamp caps available such as Megaman’s range of LED replacment candle and golf ball lamps. Manufacturers that offer all lamp caps will pick up most sales for lamps, as with LED’s each manufacturers lamp is visually different. The client will want all the bulbs they change to match, so if you don’t offer all lamp caps you wont make the sales unless the client has screw cap fixtures only. To back this up Megaman’s best selling LED candle has an SBC small bayonet cap. Until the big electronics companies realise that they need to offer a comprehensive range of lamp caps their household name alone will not make them a success in the Lighting Industry.